(Bloomberg Opinion) -- Crow’s feet are in and cold cuts are out at Nestle SA. The company said Thursday it was considering a sale of its Herta meat business, which could be worth about 1.3 billion francs ($1.3 billion), according to Martin Deboo at Jefferies. This announcement follows a recent Bloomberg News report that it could consider a full sale of its skin health business, which includes cosmetic fillers among its products and could fetch about $10 billion. Of course, Chief Executive Officer Mark Schneider needs to show that he can get a good price for both. He has done well with the divisions he has offloaded so far, generating $2.8 billion from the U.S. confectionery business and $1.55 billion from the Gerber life assurance unit. And the signs are good for Nestle Skin Health: its performance is improving. The company has also made progress operationally. It lifted its top line in 2018, reporting organic growth of 3 percent, up from 2.4 percent in 2017. Still, with Dan Loeb’s Third Point agitating for change, he can’t afford any slip ups. Loeb has called for Nestle to step up the pace. Clearly Schneider is doing this. Two years ago, Nestle said it would be prepared to churn 10 percent of its portfolio. It is already at roughly 8 percent and so could exceed its original target. The company completed acquisitions and disposals with a total transaction value of $14 billion in 2018. Some of these were significant, such as the $7.15 billion deal to market Starbucks Corp. products. Others were smaller purchases in faster-growing segments of the market. There are further units that Schneider could turn to as he streamlines the company, such as parts of the U.S. frozen food business and joint ventures in chilled dairy, cereals and ice cream. But there is one asset that he seems reluctant to part with: Nestle’s more than $30 billion stake in L’Oreal. It clearly doesn’t need the money right now. Even with M&A and a share buy back, net debt is within the company's comfort level at 1.6 times Ebitda. However, Loeb is pressuring the company for a sale. The L'Oreal stake is clearly non-core. But Schneider has shown that he is prepared to move only when he feels the time is right. He didn't put Herta up for sale earlier, for example, because he wanted to launch plant based products under the brand first. At Nestle Skin Health, he restructured the unit before exploring options for it. He can now look at unloading it from a position of strength. This approach gives some confidence that he will divest the holding when it makes the most sense for Nestle. Investors certainly appear to be on his side. 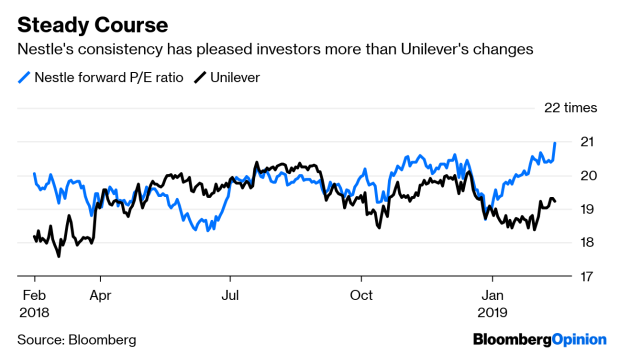 Nestle shares climbed to a record on Thursday, and trade on a forward price earnings ratio of about 21 times, a deserved premium to Unilever’s 19 times. In contrast to its rival's strategic flip-flopping, Schneider is doing exactly what he said he would. That steady course looks appealing.